Upper Arms: Benefits and Features. No frame modifications required. Direct replacement for stock upper control arms. Built in 6 degree's of positive caster provides straight line stability. Caster also improves corner entry do to new camber curve. Upper arms reduce factory bump steer by cutting it in half. (Beneficial for both drag, street, and road racing applications). Stock Ball Joints are used. Will accept any stock style spindle. 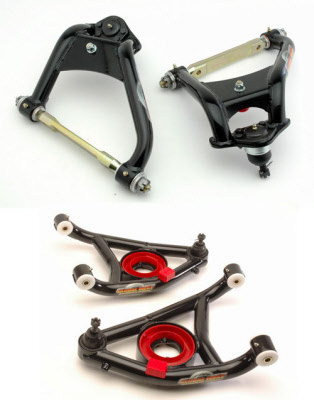 Control arms are fully assembled with billet shafts, uses Polyurethane, ball joints, and bump stops. Del-A-Lum bushings are also avaialable. Tubular arms are powder coated black. Provisions for adjustable bump stops (Drag racing). New alignment specifications are included in every kit. Control arms can be used with lowered frame holes. Upper arms will work with coilover kits. Global West's tubular lower arms are perfect for stock or performance suspension upgrades. Both arms are supplied with ball joints, bump stops, control arm bushings, and a innovative rotating spring cushion. The cushion acts two fold by offering isolation and a proper indexing of the coil spring. Even if you trim your coil spring in order to lower the car, the lower spring cushion simply rotates for proper re-index. The control arms also provide additional header tube clearance, requires no frame modifications and are pre-assembled for your conveyance. Global West's control arms are well designed providing excellent support around the spring, ball joint and bushing areas. Straps are utilized at the bushing locations while 3 tubes support the spring pocket. The sway bar mounting plate acts as a gusset strengthening the ball joint area. Incorporate our rotating spring pocket and you have an unbeatable package. The following list specifies standard features with this lower control arm. Strength: (Built out of 1 5/8 roll cage tubing ). Polyurethane bushings are used for most applications. Del-A-Lum Bushings are also available. Reinforced sway bar pick up points. Lower arm bump stops are standard. Steering bump stops are standard. Cross bar supporting spring pocket. Additional clearance is added through the middle of the arm for header tubes. Traditional Global West straps are used at bushing housing locations for strength. Control arms are powder coated black. can be utilized for street, strip, road racing, and oval track. Del-A-lum bushings are approved for all NHRA classes including stock. What is a Del-a-Lum bushing? Del-a-lum bushings in suspension perform like a bearing but are still considered a bushing. The outer portion of the bushing is an aluminum housing. The aluminum housing is machined with grease groves and has provision for a grease fitting. The bushing presses into the control arm similar to that of a factory bushing. The internal part of the bushing has a plastic rotating sleeve. The sleeve provides isolation between the steel pin and /or shaft (depending on location). The sleeve also acts as a bearing surface for the control arm to pivot on. Each side of the bushing has additional plastic thrust washers backed by steel thrust washers. The thrust washers are separate from the internal sleeve and provide fore and aft control. A grease fitting is employed with each bushing so full lubrication is achieved. Del-alum bushings do not squeak or make noise. They are exclusive with Global West. The Del-a-Lum bushings are also approved for several racing associations including NHRA. We manufacture them for several companies including one of the majors. Zero deflection without suspension bind. Perfect for all types of driving. Smooth movement up and down. Grease fittings provide full lubrication. Internal grease grooves transfer lubrication throughout the bushing which promotes bushing life and assures a quiet ride. Aluminum housing provides easy press installation. (These directly replace your stock bushings). Plastic internal inserts rotate for smooth control arm movement. Bushings have a limited life time warranty to the original purchaser. When you order a control arm with Del-a-lum bushings. Global West will warranty the the control arm, bushings, and shafts for as long as you own your car. This is a limited warranty with restrictions. For further information about our warranty contact Global West.